Date & start time: Saturday 13th March 2010, 1 pm start. 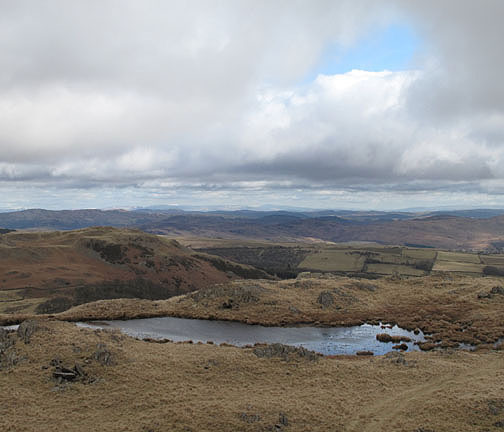 Places visited : Stickle Pike, Tarn Hill, Great Stickle, back to the car, Park Head Track to Caw Fell and back. a second time. 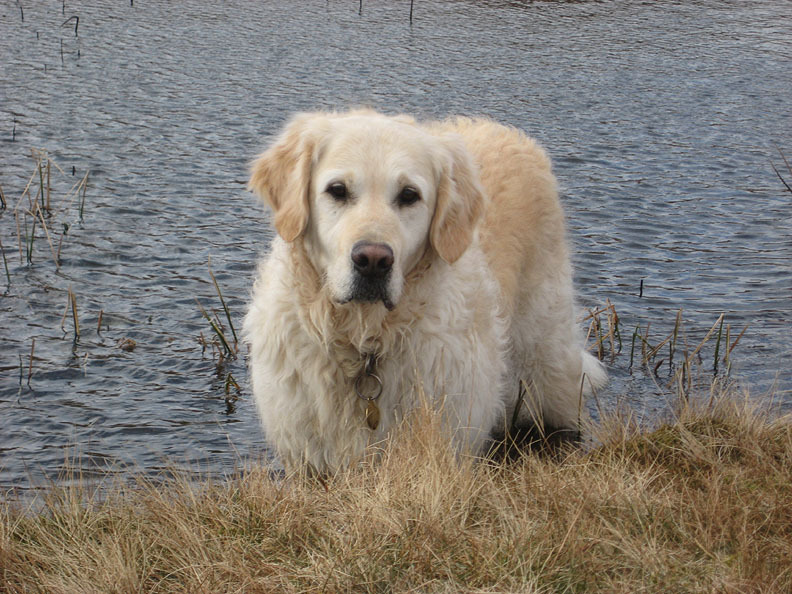 Walk details : 6.25 mls, 1850 ft, 4 hrs 50 mins including lunch. Weather : Fine and dry but with variable amounts of cloud. 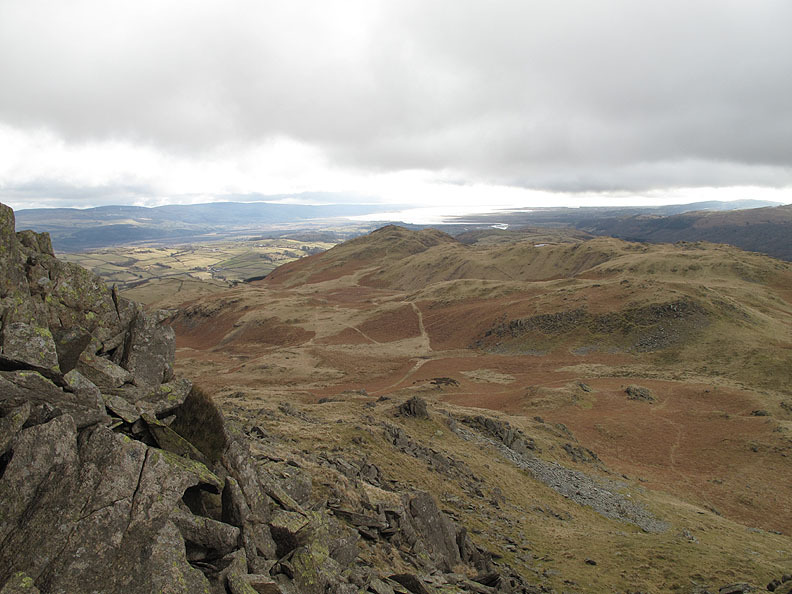 A trip to the south west of the Cumbrian Lakes to climb two minor peaks. 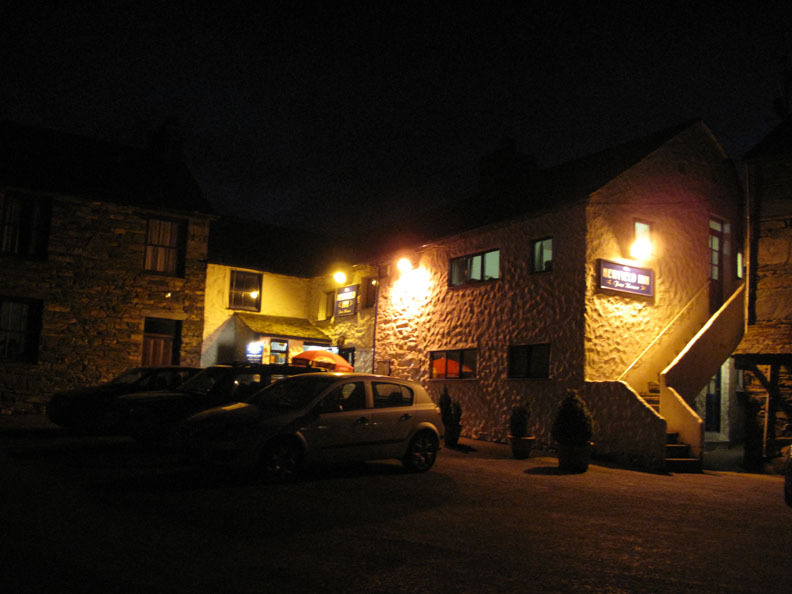 We travel down the west coast of Cumbria and then cross the Corney Fell Road to reach our destination. 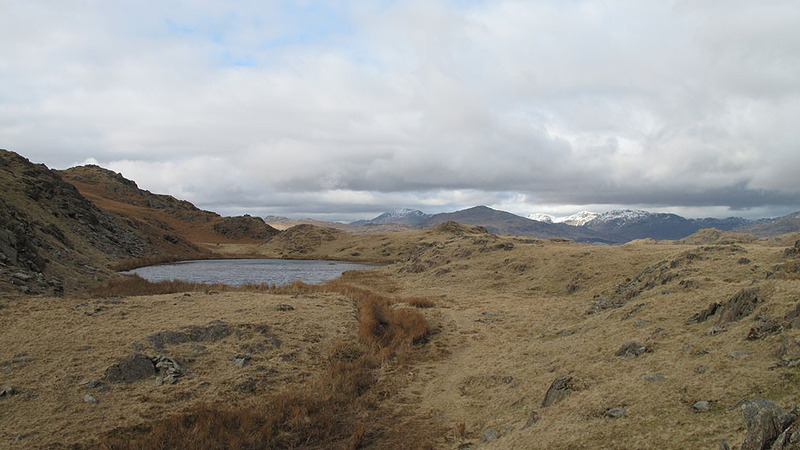 Stickle Pike is the lower fell in shadow and Caw is behind it to the left, rather hidden in front of the other Coniston Fells. 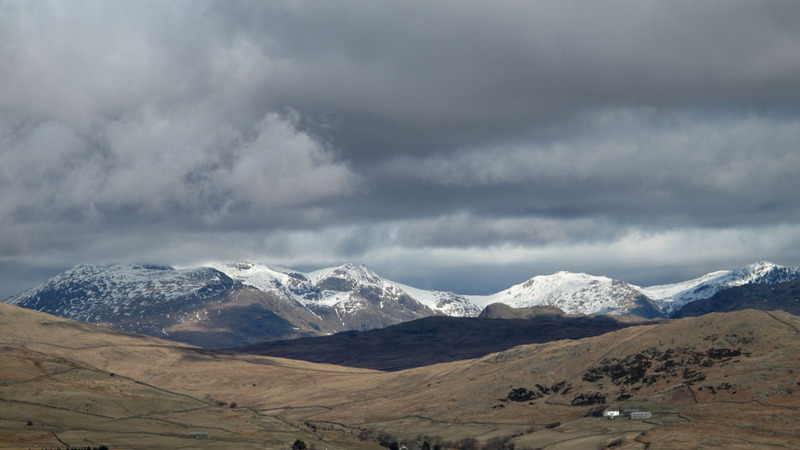 Zooming in on Scafell and the Pike (in cloud), Ill Crag, Esk Pike and Bowfell. Still plenty of snow up there . . . and a brisk north westerly blowing the clouds across too. 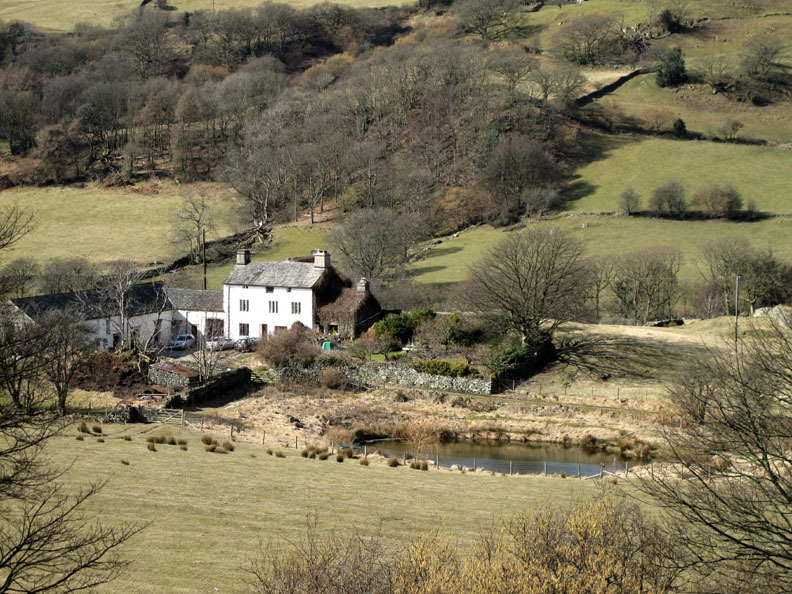 but it did mean we passed this delightful old farm house of Lumholme near Broughton Mills. 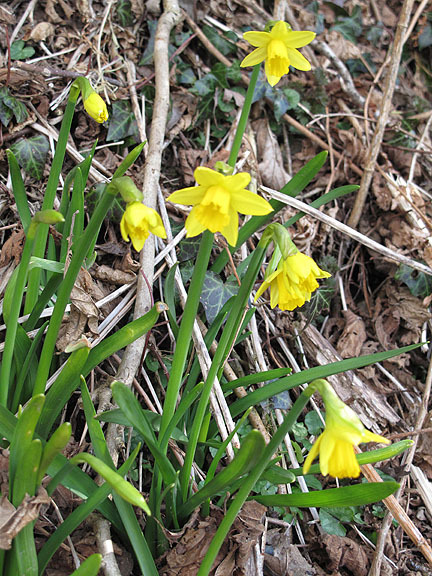 In the layby where we took the previous shot - early daffodils. 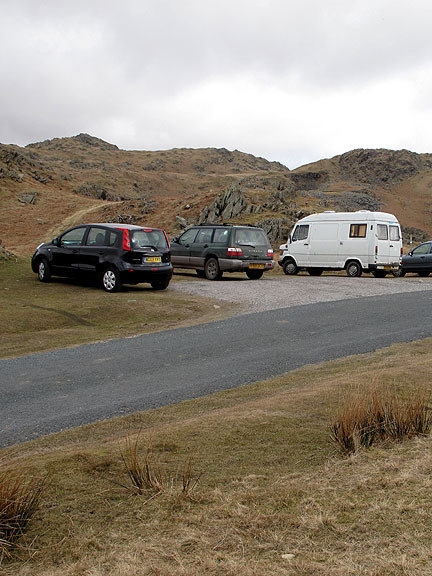 Car parking today on the hause of Kiln Bank. A relaxed day in respect of planning and it was only once we were out of the car that the initial route was decided. 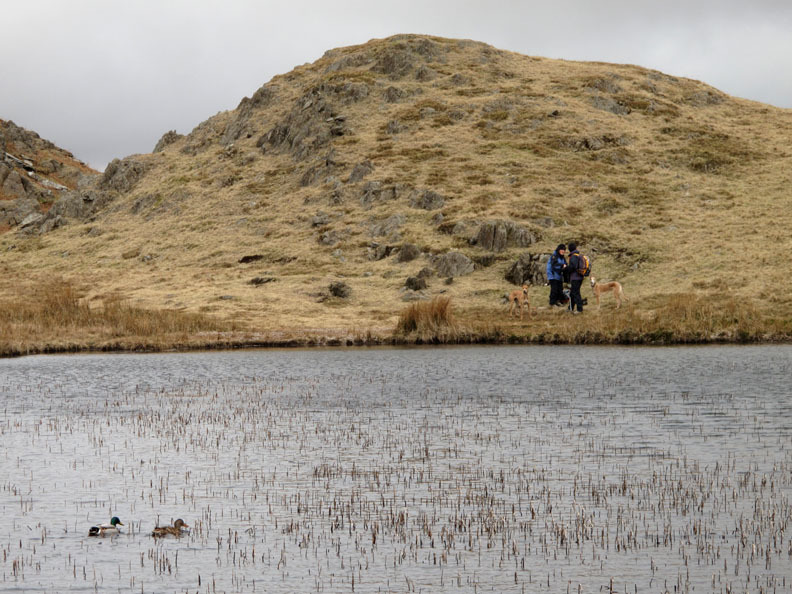 First the ascent of Stickle Pike, stopping off briefly at Stickle Tarn. 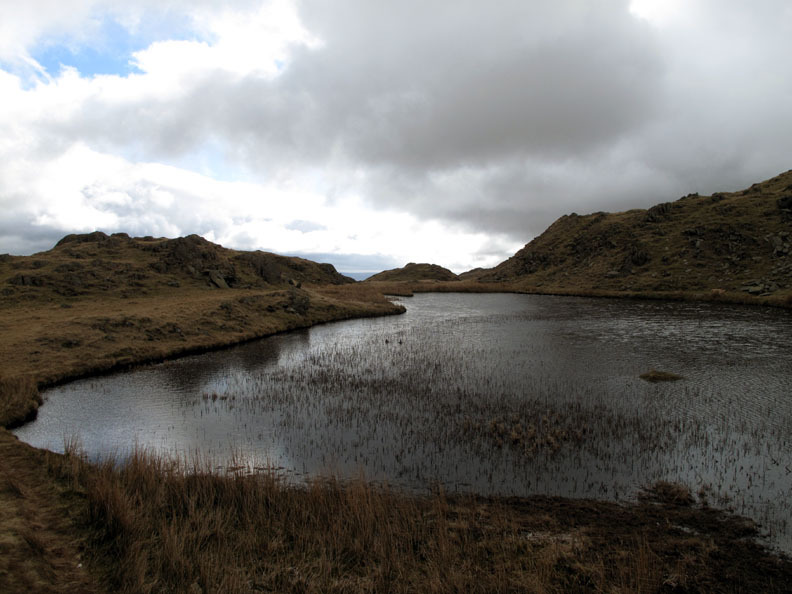 Dramatic and dynamic clouds fly by above the small upland tarn. 2 ducks, 2 dogs, 2 girls. 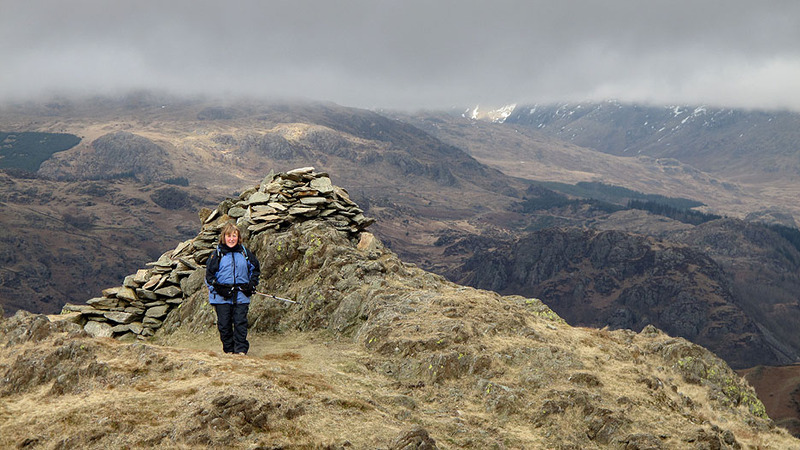 Ann chooses the main cairn as I stand back on the secondary top. 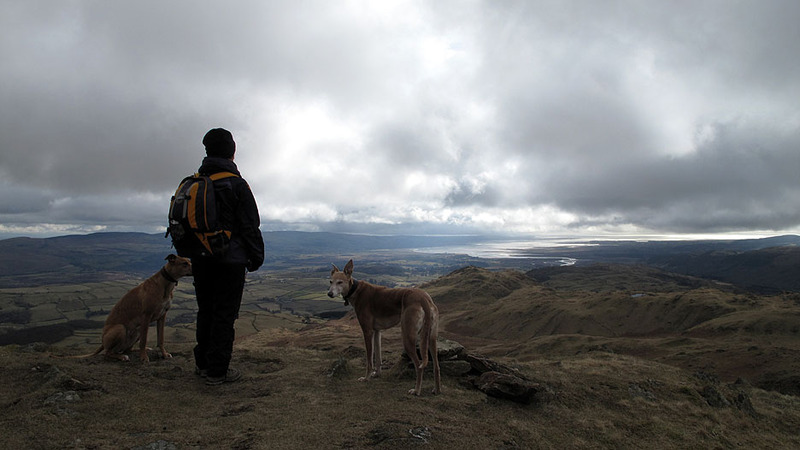 We swap places which gave me the chance to photograph the Duddon Estuary behind her as well. 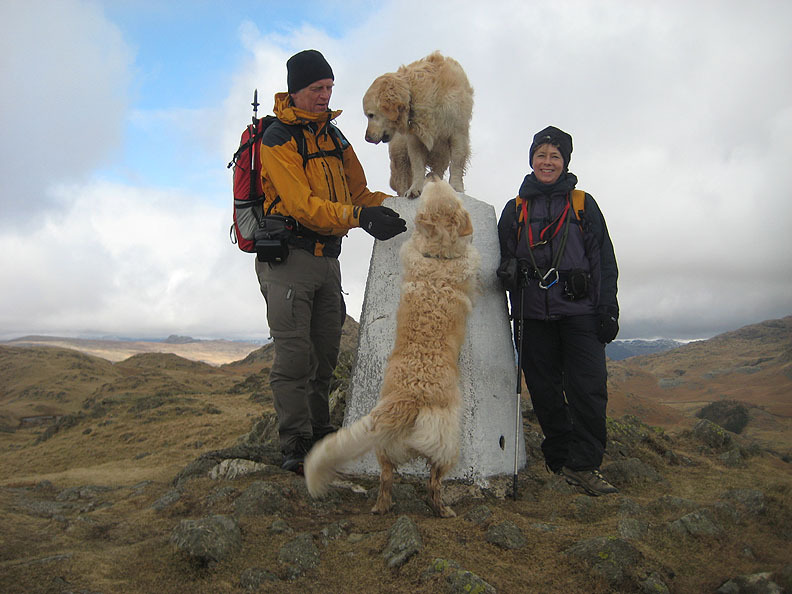 Jo stands on the southern viewpoint with her two dogs, Amber and Jodie. 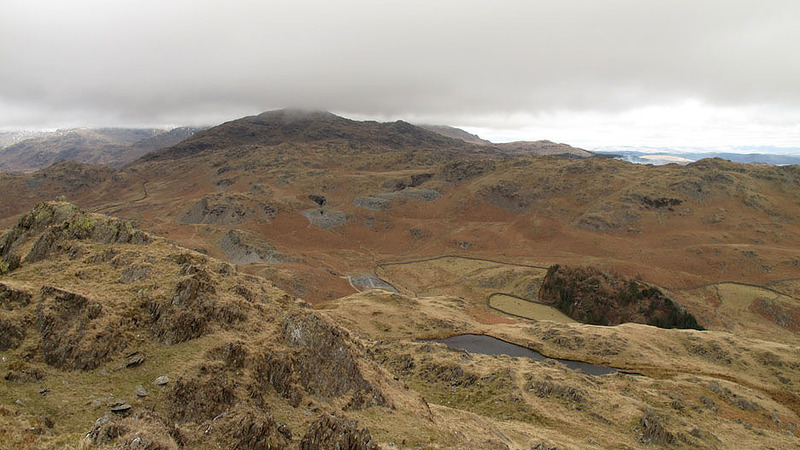 Looking back at Stickle Tarn, the Stainton Ground Quarries and the cloud capped Caw Fell. 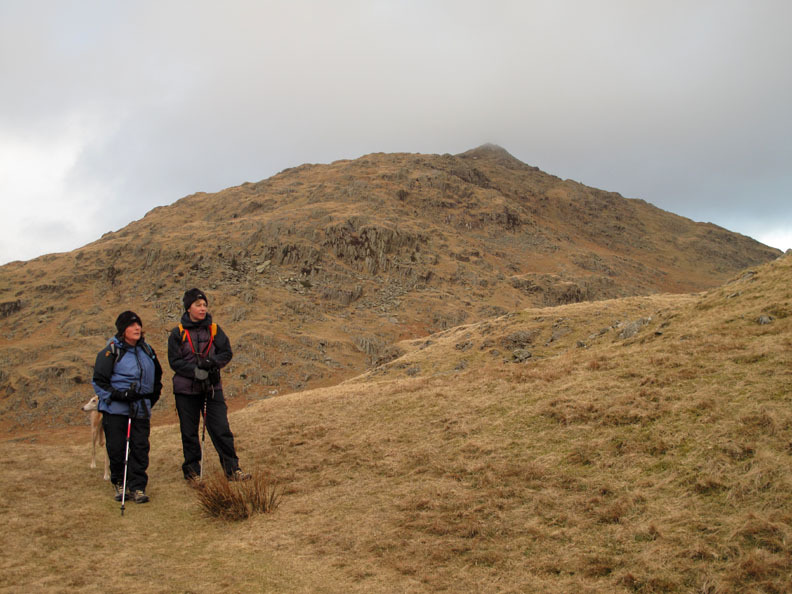 We walked Stickle Pike first and keep Caw summit for later in the afternoon. 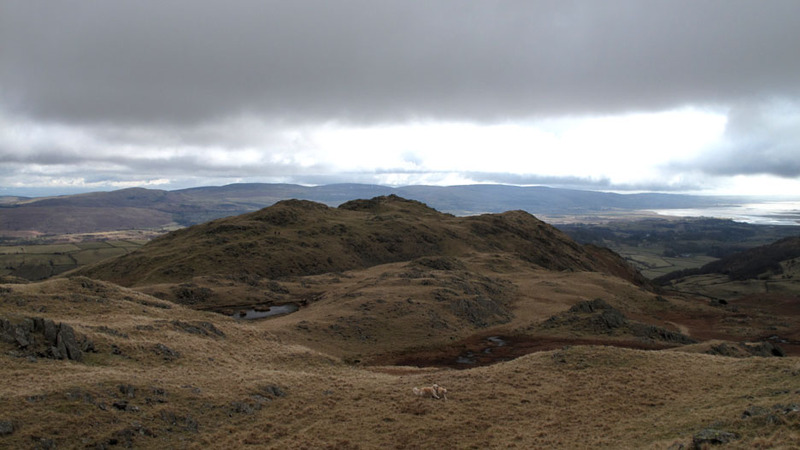 we decide to extend the walk to include the trig point on Great Stickle which, confusingly, is lower than Stickle Pike. 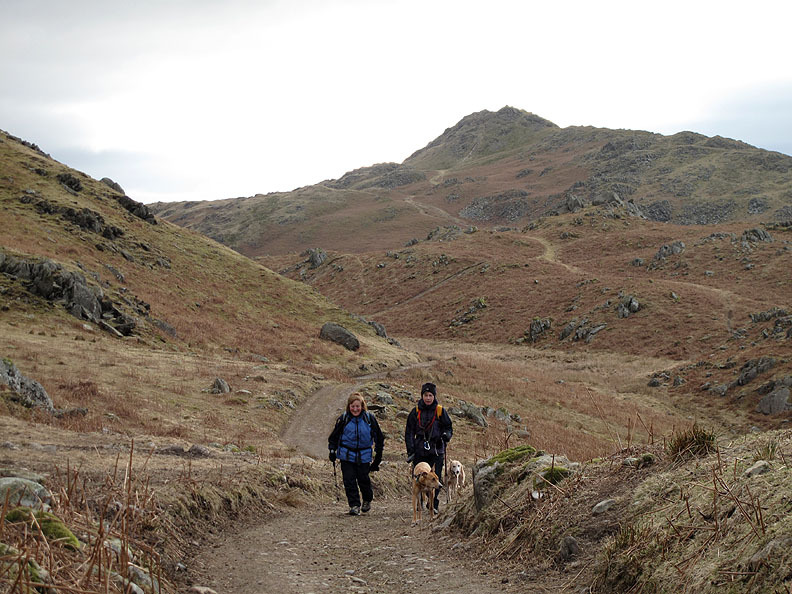 Harry and Bethan wait as we descend from the Pike. 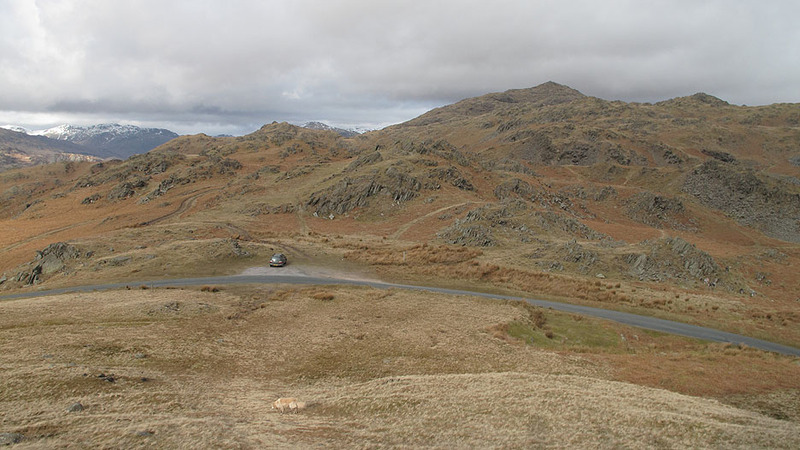 Duddon Valley is spread out below and the road over to Eskdale disappears into the distance behind them. 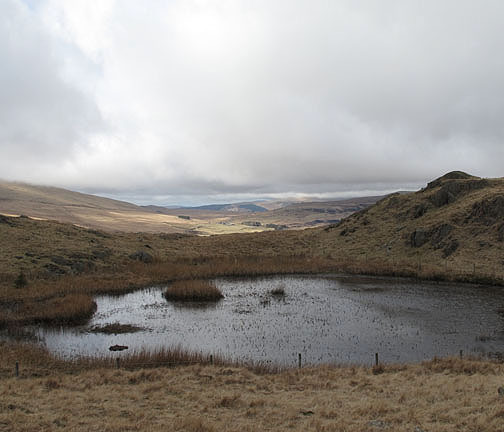 Presumably Tarn Hill is named as a result of the fact . . .
. . . that there are lots of tarns on it. 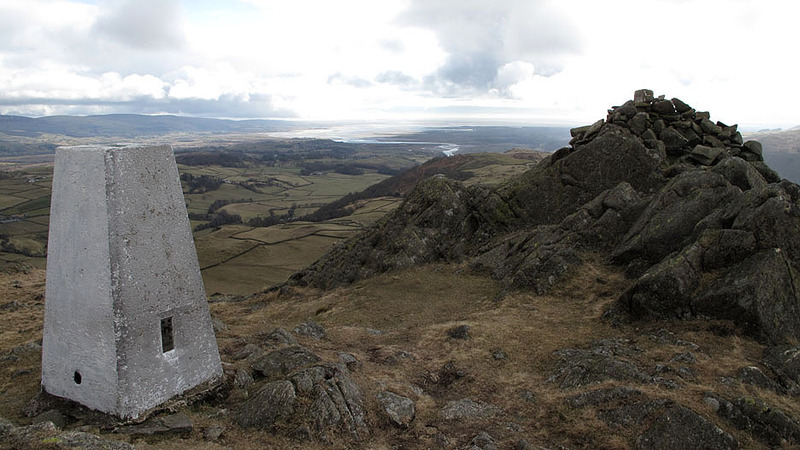 A white painted trig point, but only painted on three sides. The fourth side, facing away from the road below, failed to qualify for that moral boosting look. Bethan claims the high ground much to Harry's dismay. The stony ground around the trig meant that she had to have a hand up this time. 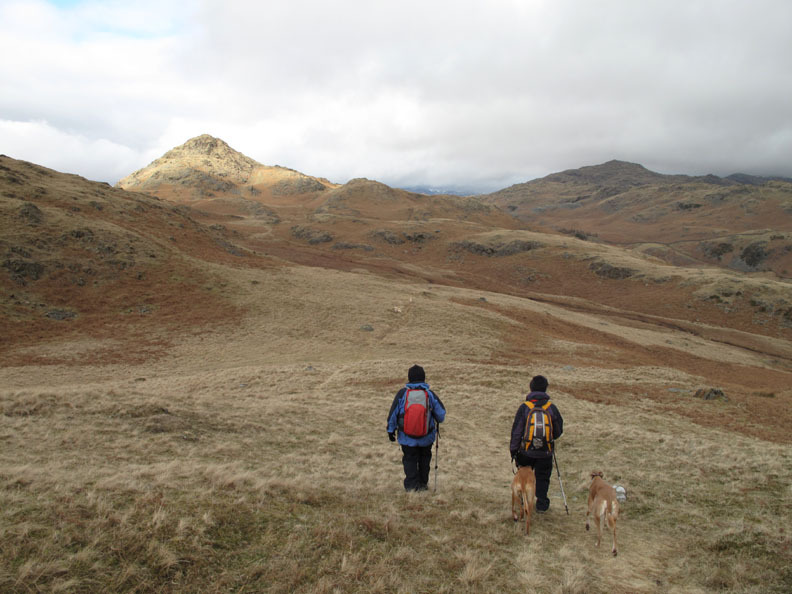 Looking back at Stickle Pike . 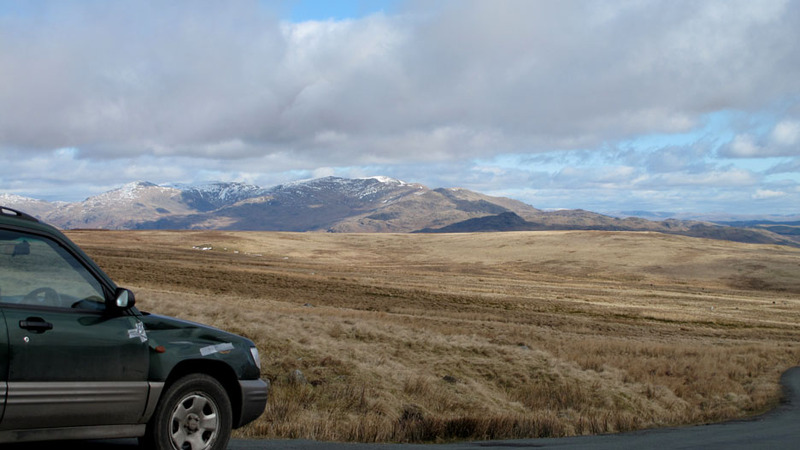 . . but what caught our eye was that lumpy summit in the background. 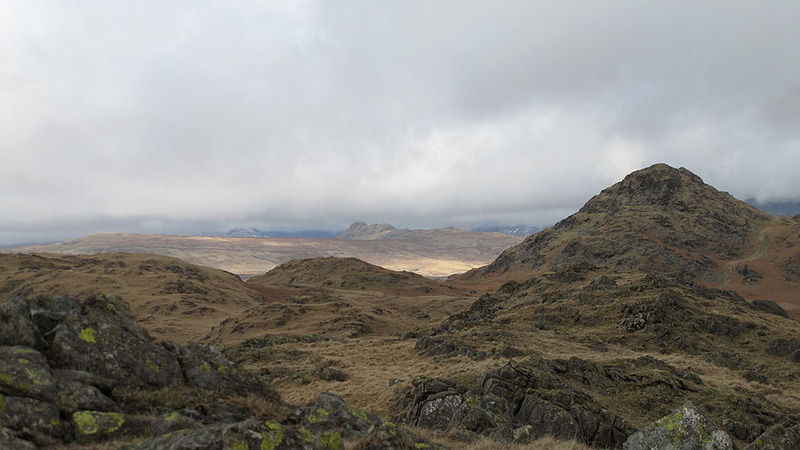 It turned out to be Green Crag, normally climbed from the Eskdale Valley. 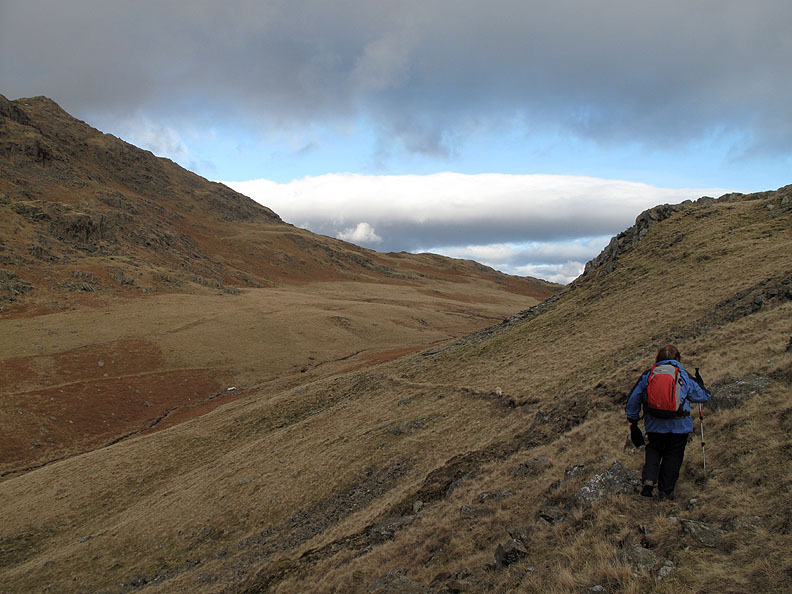 A low level return towards Stickle Pike. 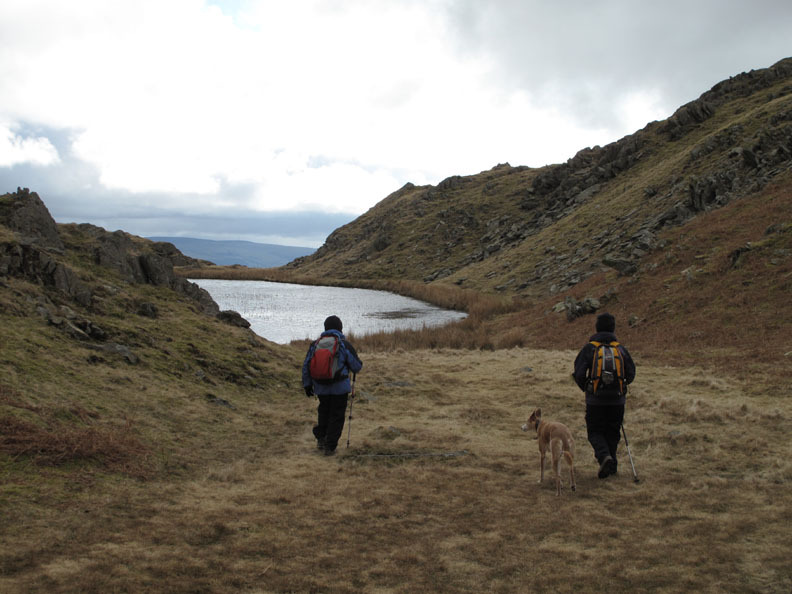 but our route does take us past Stickle Tarn a second time. Oh good . . . another chance to cool the feet ! 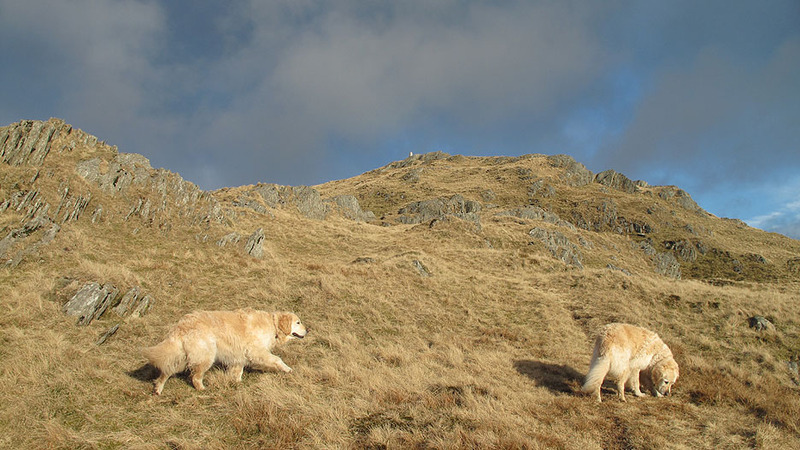 Back to the car but no stopping this time as we continue past it, heading for the distant summit of Caw Fell. No-one was more confused than the dogs who walked directly to the back of the car and expected it to be opened for them. 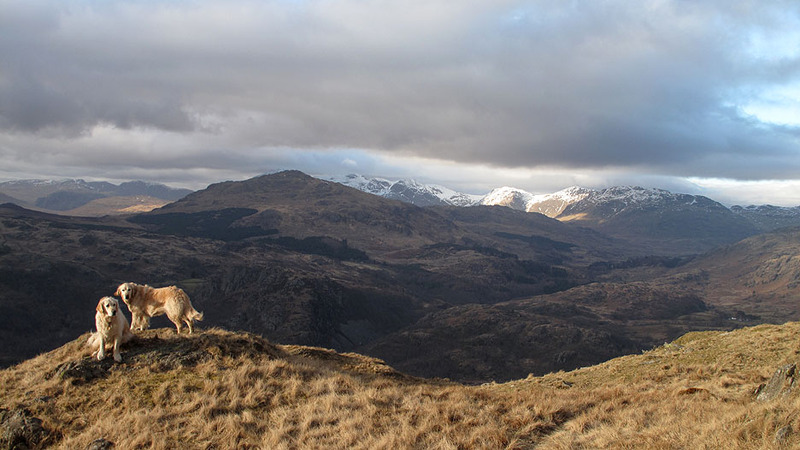 we continue on the Park Head Track towards Caw. we diverted on a path that traversed across into the valley towards our second major summit of the day. Intermittent sunshine added wonderful colour to this and the distant fells. 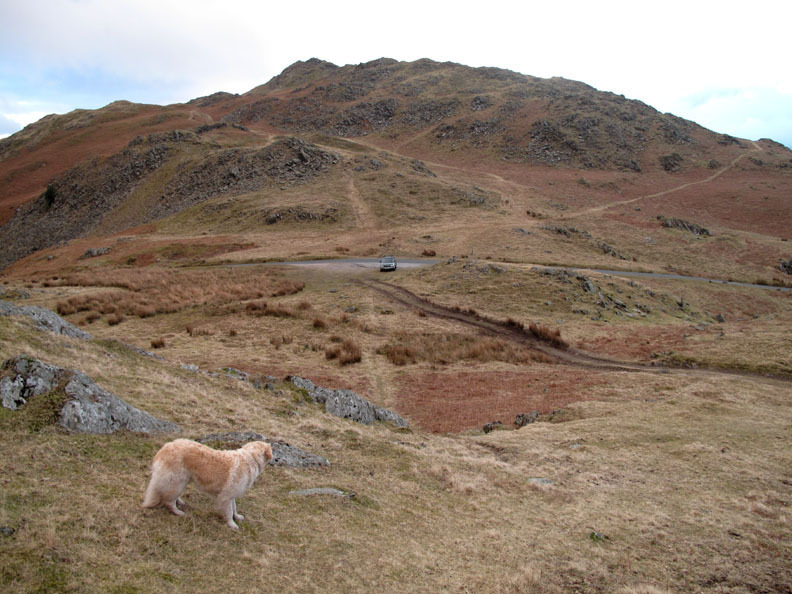 The prominent Harter Fell however was having none at this point. 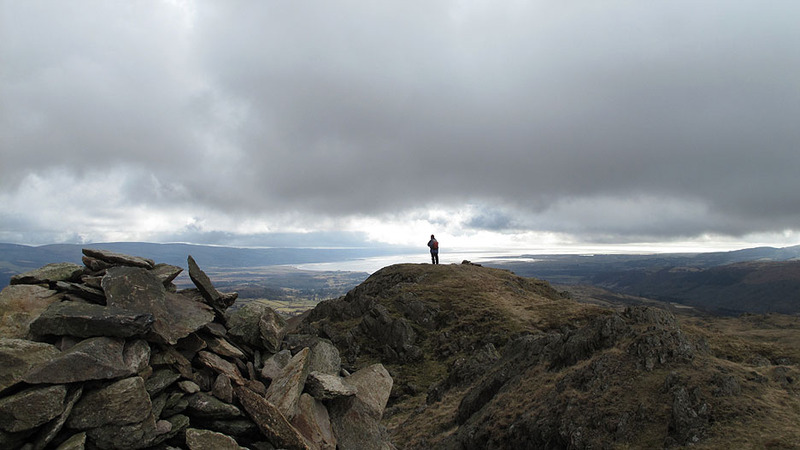 the false summits and steep ground sapping our strength, until the summit cairn finally came in sight. 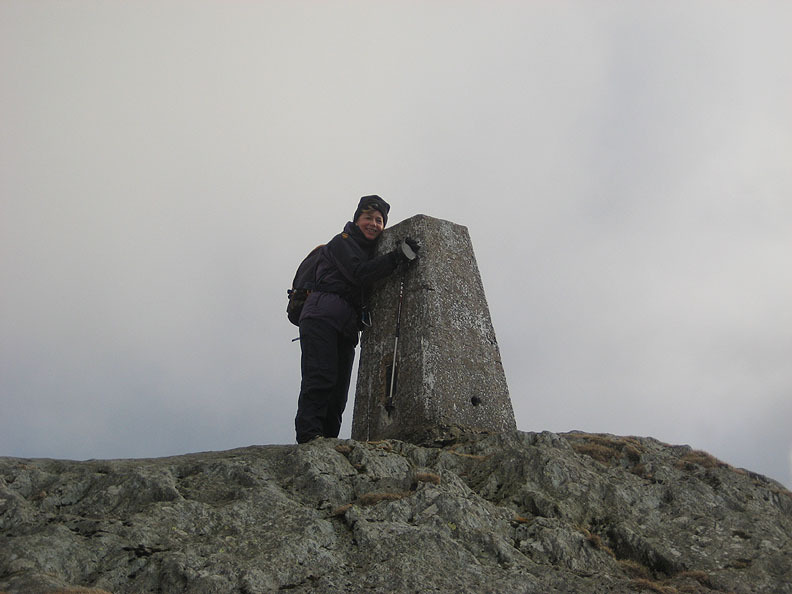 Jo doing a bit of " hug-the-trig " in appreciation of actually making it to the top. 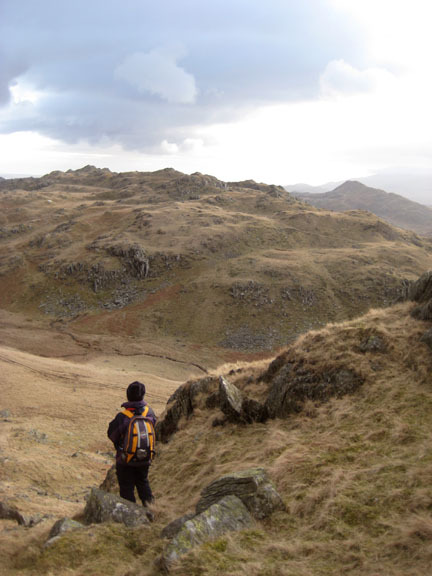 then veers round left to take in Crinkles, Bowfell, Esk Pike and the Scafells. Caw is a really good viewpoint. 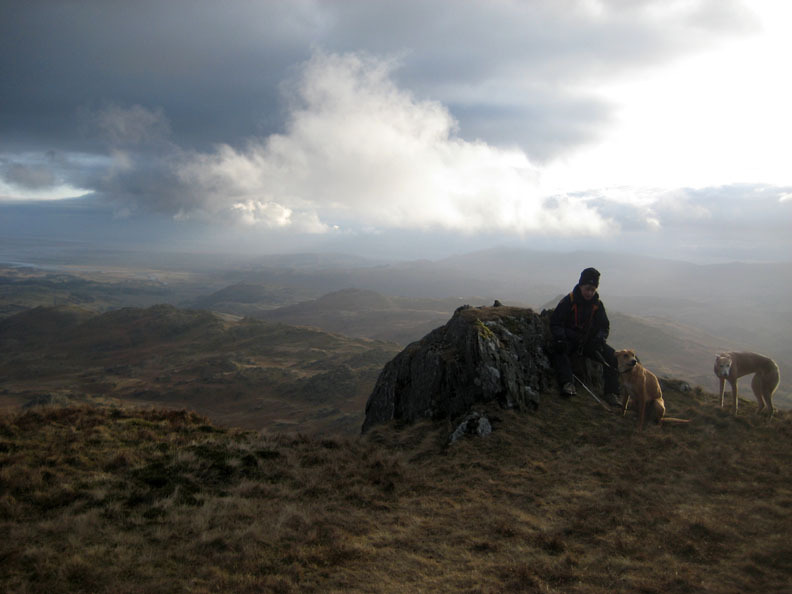 lunch having been taken on Great Stickle some time back. Multi layered clouds over the Duddon Estuary. on a reasonable if rather faint path. just short of that ascent. 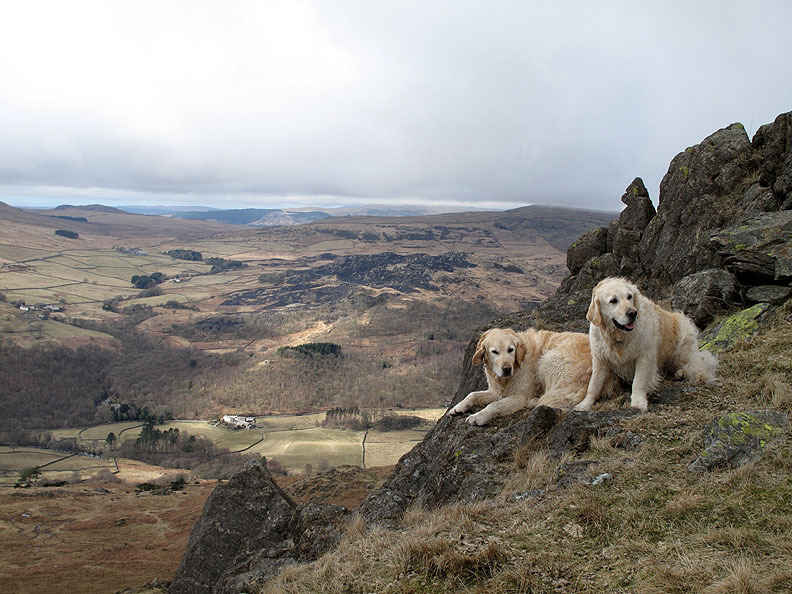 Two delightful Wainwright Outlying Fells completed . . .
just in time too as the summit of Caw is once again shrouded in mist. 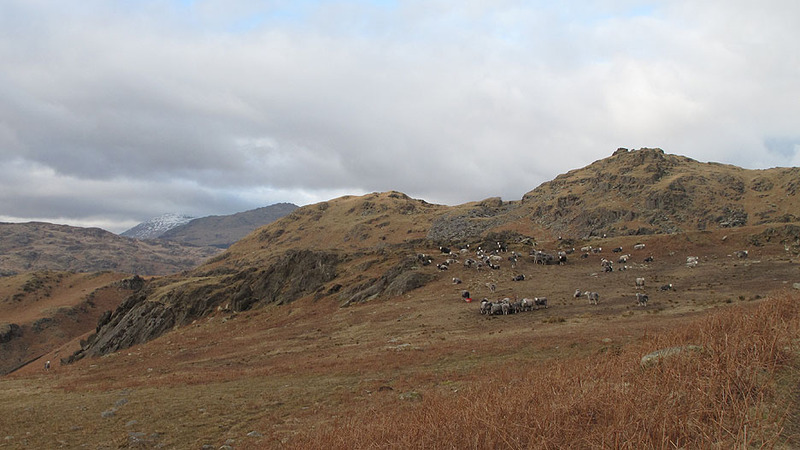 On the way back we passed the sheep feeding beneath Brock Barrow. Ann did start counting how many there were but she fell asleep ! Yes . . . this time we will stop at the car . . . as it is the end of the walk. 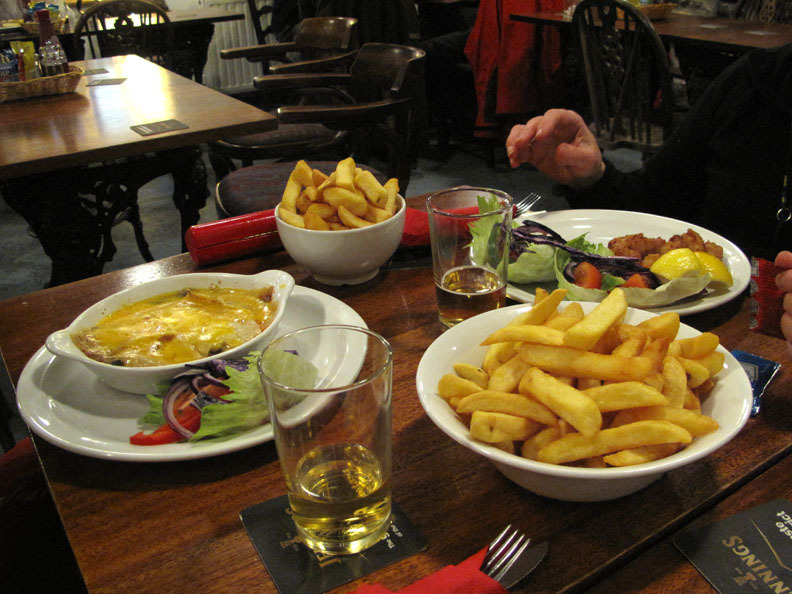 Two Lasagne, one Scampi and three portions of chips . . . that will do nicely. 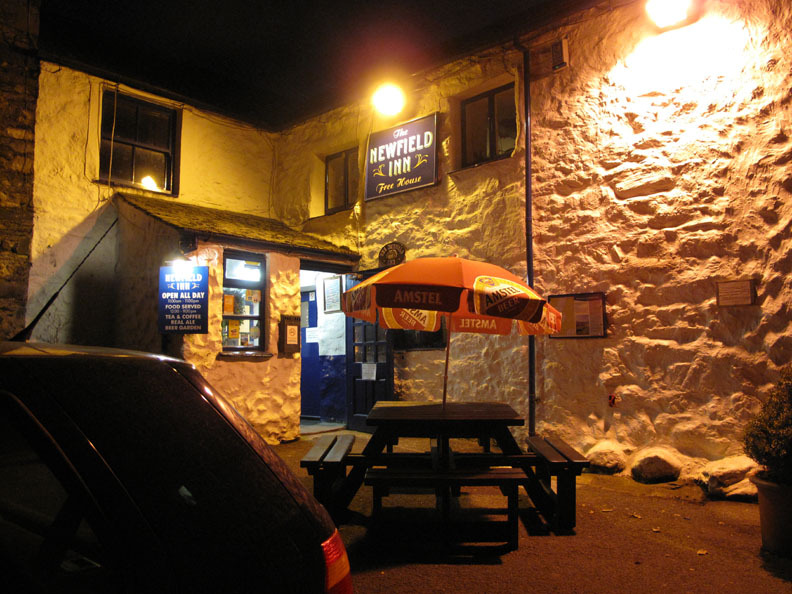 Full marks to the Newfield Inn for their hospitality. Now for that slightly longer than normal drive home. This site best viewed with . . . a doggy bag (serviette) for the left-overs.